Luton striker Elliot Lee is hopeful that his impressive performance and goal at Cheltenham Town last weekend will be enough to earn a starting role against Cambridge United on Saturday. The 22-year-old came off the bench to replace the injured James Collins for the second half at Whaddon Road and made an excellent impact, looking dangerous throughout. He thought he had won the match for the visitors too, showing predatory instincts to fire home with five minutes remaining to make it 2-1. However, Luton then conceded a last-minute equaliser as they were pegged back, but on his own display, Lee said: “I came here to play football, that’s what I’m here to do. “I’m here to score goals and we’ll see what happens this season as I want to be playing football, I want to be scoring goals for this team. “So I’m really looking forward to getting myself in the team and doing it. I think I’ve been doing all right, I’m not playing as much football as I’d like, but I feel like I’ve made a difference. “I think I’ve been doing all right, I’m not playing as much football as I’d like, but I feel like I’ve made a difference. “I’ve got the goal and listen, I’m going to keep pushing for a start and starting every week as that’s the only thing I can do. “Personally it’s a bittersweet feeling for me, as three points was the main thing. “We go into every game wanting three points and it was always going to be a tough game coming here. 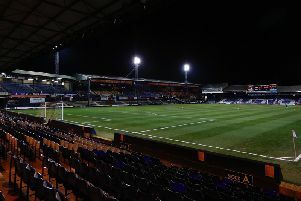 Although Lee has made 10 league appearances this term for the Hatters, they have all come from the bench, as he had been restricted to just 67 minutes of League Two action prior to Saturday. The ex-West Ham forward, admitted it has led to a few discussions with boss Nathan Jones as he continued: “I’ve had a few chats with the manager about it and the front three have been doing well, so I can’t complain too much. “But I came here to play football, I want to play football, that’s all I want to do and I want to score goals for Luton Town. “I’ll take my opportunity when it comes, I’m chomping at the bit to play every week.